The good folks here at Figure Realm try to give you accurate, unbiased, and most importantly, free information on action figures all day everyday! But of course, reviews and an occasional rant can only go so far, that 's why we encourage you to contribute! 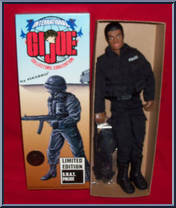 We're trying to build the largest, most informative, and simplest to use action figure gallery on the planet for every person out there to enjoy. Whether you want to know how many figures are in a series or the name of a certain figure or even if you just want to stare awestruck at all the pretty colors, galleries help everyone. What can you do to help? Glad you asked! Contribute pictures, update details or suggest corrections for S.W.A.T. Police (Black). Write a review about S.W.A.T. Police (Black). To post a link or picture, simply copy the the full URL into your post, and it will automatically get converted (after submitting). Make sure URL has a space on both sides of it, or is on its own line. Do not use HTML or BBCode tags. To find a picture's URL on a website, in most browsers, you can right-click the image and select "Copy image URL". From Imgur, copy the link from the url when you are viewing it, or click their Copy button if you are uploading a new image. Posting links or pictures is only allowed in certain areas of Figure Realm. Please state why this comment is being reported.